Well it’s not so much they don’t like fishing, more that deep-sea shark populations struggle to recover from too much fishing. To compensate for collapsing coastal fish stocks, many commercial fisheries have expanded operations into deeper waters in search of new bountiful fish stocks. Some of the most heavily affected fish from this expanded exploitation are the chondrichthyans (sharks, skates, rays and chimaera). The sensitivity of sharks and rays to fishing pressures has been well documented in many continental shelf and pelagic fisheries, however, it is now clear that the deep-sea sharks are some of the most vulnerable to fishing pressures. About 50% of all living shark species inhabit the deep-sea (greater than 200m), of which the Squaliformes or dogfishes are the most abundant. Where historically the deep ocean once served as a refuge or safe haven, the intrusion of fishing operations now threatens many of the deeper shark populations. Why is it that the deep-water sharks are more sensitive than their shallower counterparts to fishing exploitation? Life in the deep ocean is very different to that of the shallower warmer waters above. It’s a much darker, colder world that mainly relies upon the influx of nutrients from the shallower ecosystems above. Accordingly, the life history characteristics of the animals (growth, reproduction, etc.) that inhabit these depths are different to those that inhabit shallower habitats. Now, whilst these life history traits are well adapted for life at depth, they are unfortunately the same reasons that make these populations highly sensitive to fishing exploitation. Many deep-sea fish, including the chondrichthyans, are characterised by having a very low metabolism. Whilst low temperatures and limited food availability have been attributed to low metabolic rates, it has been suggested that low light levels and the subsequent relaxed predator-prey interactions may have in fact played an important role in reducing their need for high metabolic rates. Deep-water sharks are slow growing in comparison to other groups of sharks, therefore reaching sexual maturity at much later ages than their pelagic and shelf counterparts. Many deep-sea sharks only reach sexual maturity when they are almost fully grown. Due to the high maternal investment required for reproduction (discussed below), this late maturity allows females sharks to reach a sufficient size that allows them to support associated high energetic costs. The female Portuguese dogfish (Centroscymnus coelolepis) for example, typically reaches sexual maturity at about 82% of their maximum length. 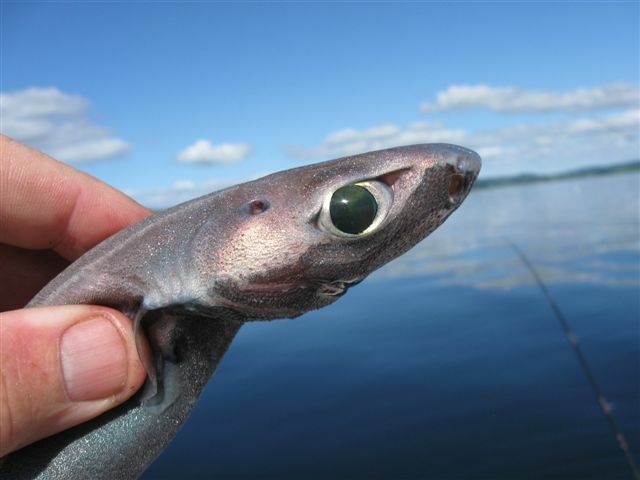 The leafscale gulper shark (Centrophorus squamosus) reaches sexual maturity at about 35 years old and is suspected to live in excess of 70 years. Most deep-water sharks are viviparous, meaning eggs are internally fertilised and hatch within the female. The pups are then retained by the female where they feed off a yolk sac until they are born alive and lead an immediate independent life. Investing in fewer but larger developed pups is thought to increase their survival rate once born into their deep-sea habitat. The gulper shark (Centrophorus granulosus) will only have one pup every two years. In the Portuguese shark (C. coelolepis), a full reproductive cycle is thought to take up to two years, followed by a significant resting phase between cycles. The culmination of these life history traits subsequently means that shark populations at these depths have low productivity. When compared to shelf and pelagic species, it has been calculated deep-sea sharks have population doubling times that can be twice as long as their shallower counterparts. Europe has now recognised the fragility of deep-sea shark populations and since 2005/2006, the EU fisheries council has implemented total allowable catch (TACs) limits for some deep-sea shark species. In many European countries, deep-sea sharks now have a zero TAC, meaning that landing them is no longer permitted. However deep-sea fisheries targeting black scabbard, orange roughy, etc., use non-selective fishing methods and consequently are still by-catching high levels of sharks. Whilst these shark catches must often be discarded, fishing mortality can be high for deep-sea sharks. So whilst fishermen are no longer allowed to target deep-sea sharks, they still have the potential to exacerbate population depletion in this highly vulnerable group of sharks. Recently (December 2013), European Parliament failed to eliminate deep-sea bottom trawling from the North East Atlantic. It is clearly evident that politics and economics are hampering essential conservation and management efforts. To complicate matters further, many deep-sea sharks are simply lacking the basic biological knowledge that is needed to accurately assess their true vulnerability. If fisheries are to move toward true sustainability, the fragility of deep-sea sharks and other fish must be incorporated into future management and policies. The persistent use of highly destructive non-selective fishing methods in the deep ocean will continually hinder the much needed conservation and management of essential yet highly vulnerable deep-sea sharks. Clarke, M. W. Sharks, skates and rays in the northeast Atlantic: population status, advice and management. Journal of Applied Ichthyology 25, 3-8 (2009). Clarke, M. W., Kelly, C. J., Connolly, P. L. & Molloy, J. P. A life history approach to the assessment and management of deepwater fisheries in the Northeast Atlantic. Journal of Northwest Atlantic Fishery Science 31, 401-411 (2003). Garcia, V. B., Lucifora, L. O. & Myers, R. A. The importance of habitat and life history to extinction risk in sharks, skates, rays and chimaeras. P R Soc B 275, 83-89 (2008). Guallart, J. & Vicent, J. Changes in Composition During Embryo Development of the Gulper Shark, Centrophorus Granulosus (Elasmobranchii, Centrophoridae): An Assessment of Maternal-embryonic Nutritional Relationships. Environmental Biology of Fishes 61, 135-150 (2001). Norse, E. A. et al. Sustainability of deep-sea fisheries. Marine Policy 36, 307-320 (2012). Simpfendorfer, C. A. & Kyne, P. M. Limited potential to recover from overfishing raises concerns for deep-sea sharks, rays and chimaeras. Environmental Conservation 36, 97-103 (2009). Veríssimo, A., Gordo, L. & Figueiredo, I. Reproductive biology and embryonic development of Centroscymnus coelolepis in Portuguese mainland waters. ICES Journal of Marine Science: Journal du Conseil 60, 1335-1341 (2003). Shark Alliance (Accessed March 2014): http://www.sharkalliance.org.